The largest U.S. pork producer, Smithfield Foods, is showing considerable progress in realizing its commitment to shift breeding pigs out of gestation crates, which immobilize them, to group housing. The move is widely considered more humane, greatly boosting the animals' living conditions by giving pigs the opportunity to move around and express some natural behaviors. Smithfield’s hog-producing subsidiary, Murphy-Brown, is reporting that over 70 percent of pregnant sows are in group housing, a 20 percent increase from last year. This is no small feat considering it has 853,000 hogs in the U.S. alone. "We made a business decision in 2007, based on input from our customers, to convert to group housing for our pregnant sows on all of our U.S. farms, and I'm proud of the fact that our employees are working very hard to make good on our commitment and complete this challenging task by 2017," says C. Larry Pope, Smithfield's president and CEO. "I am very pleased that our employees report that group housing works equally well from both an animal care and a production standpoint." Smithfield Foods has contracts with 2,100 independent farms that raise 40 percent of Smithfield sows. To encourage its independent farmers to make the change by 2022, Smithfield is only extending contracts with farms once the conversion to group living has occurred. "We have been encouraged with the initial response to our request to join with us in this commitment," says Dennis Treacy, Smithfield's executive vice president and chief sustainability officer, in a statement. 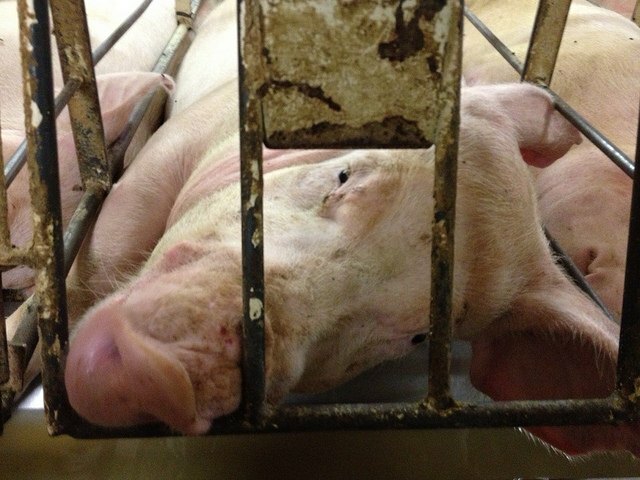 Animal welfare groups have targeted the use of gestation crates in recent years, encouraging phase-out announcements from McDonald's, Wendy's, Safeway, Costco, Oscar Mayer and others. However, even after Smithfield publicized its commitment to transition to group housing, the Humane Society filed a suit against Smithfield with the Securities and Exchange Commission in 2011. The suit accused Smithfield of making false claims on its newly launched corporate responsibility website – questioning statements that it provides hogs with "ideal" living conditions and that "every need is met." The Humane Society believed these statements were unfounded considering that, at that time, "the vast majority of its breeding sows are confined in gestation crates — metal cages that virtually immobilize animals for nearly their entire lives." Such actions help keep companies on their toes regarding corporate citizenship claims and their accuracy. In 2013, Smithfield Foods was sold to Shuanghui International Holdings, in what was the largest takeover of a U.S. company by a Chinese firm – making Shuanghui the largest pork company in the world. The sale is being touted for its potential to unlock the growth opportunity of the Chinese pork market. It has, however, raised questions about serious food safety issues in China, with some involving Shuanghui. It will be interesting to keep an eye on Smithfield in upcoming years to see how animal welfare, sustainability and food safety actions pan out.